Bangalore: The new building for Asha Jeevan, a care centre, especially for senior citizens, was inaugurated on Sunday at Pavamanapura in Gottigere on the outskirts of the city. Asha Jeevan inmates, who has been housed in Hulimavu and Bilekahalli will now move into the new 10,000 sq.ft. state of the-art 'home'. Asha Jeevan is one of the few centers in the state which takes care of bedridden patients, abandoned senior citizens and the terminally ill. Most of the elders under their care are suffering from schizophrenia, dementia and Alzhemers among other health problems. The building can house 70 people. 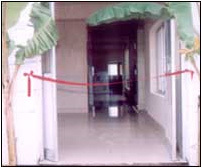 The first phase of construction can accommodate all the current inmates of Asha Jeevan. Retirement cottages will be made available for those who can afford them. Inmates are looked after by a team of trained home nurses who work round-the-clock. The center is attached to a few nursing homes and has its won ambulance and para medical services. For trustees Kalpana Mallya and Sujatha Bhat, the building is a dream made-true, with the aid of corporate honchos. The project was conceptualized was conceptualised at a proposed cost of Rs 62 lakh. A significant part of the funds for the first phase came from Dayanand Pai of Century Builders, Sunil Suresh of Stanley Seating, Sadanand Maiya of MTR Foods, Sushil Mantri of Mantri Builders, Salarpuria Trust, Kapur Trust and others. For further enquires contact - 9845184079.